The following series of range-of-motion exercises uses the SAM format, which describes the correct body position for you and your attendant, if you need assistance, and details the proper motions for you to perform the exercises safely. Remember 1010-1. Hold for a slow 10 count, repeat 10 times, one session a day. Place your palm down, with your thumb and fingers relaxed. 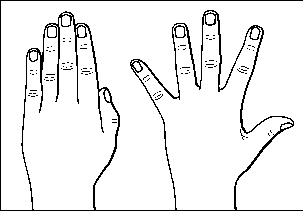 Cup your hand in both hands, with attendant's right thumb and index finger holding one knuckle while the left thumb and index finger hold the next knuckle over. 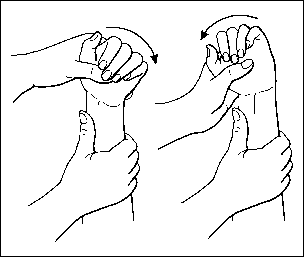 hand pushes up; then, reverse directions and move across your hand. S: Straighten your wrist and relax your fingers and thumb. A: Holds adjacent fingers straight. M: Spread fingers apart. S: Relax your wrist and fingers. wrist bent down with one hand while the other hand cups your fingertips. M: Bend your wrist straight down to your fingers; the movement should come from your knuckles and the joints of your fingers, not from your wrist. S: Place your palm up with your fingers and thumb relaxed. A: Holds your thumb over your nail. M: Touch the tip of your thumb to the base of your little finger. M: Move your thumb out and away from your palm as if you were hitchhiking. 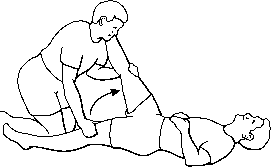 S: Lie on your back with your legs together and your knees slightly bent. A: Kneels at your feet with both hands placed on your knees. M: Bend your knees to your chest, stretching your back muscles. Place your palm up with your fingers and thumb relaxed. Stabilizes your palm with one hand while the other grasps your thumb; your attendant's thumb should be at the base of your thumb. Lie on your back with your knees bent to your chest. Kneels at your feet with both hands placed on your knees. bring them as close to the bed as they will go; keep your shoulders flat on the bed. Your attendant may need to put one hand on your opposite shoulder to hold it down. 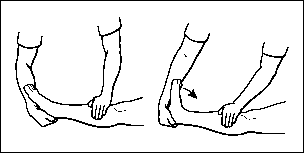 Heel Cord (Gastrocnemius/Soleus) S: Lie on your back with your knees straight. A: Cups one hand on the inside of your heel, with the forearm pressed up against the ball of your foot. M: Keeping your knee straight, attendant pulls down at your heel and presses up with the forearm, bending your foot toward your knee. S: Lie in bed with your legs straight and relaxed. A: Places both hands on top of your thigh, or places one hand on top of your thigh and the other underneath your thigh. M: Roll your knee in and out. Do not let your attendant's hands fall below your knee or there will be excessive stress to your knee. Hip Flexion and Extension S: Lie on your back with your toes pointing toward the ceiling, one knee bent toward your chest. A: Places one hand on your bent knee and the other hand just above the knee of your straight leg. M: Bend your bent leg further toward your chest, keeping your other leg straight on the bed. S: Lie on your side, not leaning forward or backward, with your upper leg slightly bent. A: Kneels behind you, one arm cupping under your knee with your calf resting on the attendant's forearm and the other hand holding your pelvis in place. M: Pull your leg straight back toward your attendant. them in place, both hands placed on your knees. M: Spread your knees apart and pull them down toward the bed, applying a firm, but not heavy pressure. S: Sit in your chair or lie in bed on your side. 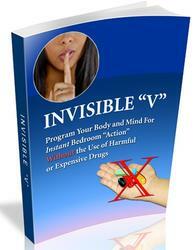 A: Stabilizes your shoulder with one hand while the other cups your arm near your elbow. M: Bring your arm behind you as if you were going to reach into your rear pocket. your hip. Keep your shoulder and elbow bent at a 90-degree angle. S: Lie on your back with your arm at your side and your palm up. A: Supports your hand and wrist with one hand while the other cups your elbow. M: Bring your arm out to your side and up to your head (similar to the movement in jumping jacks). 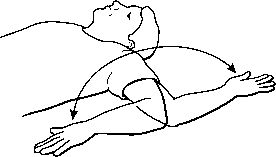 S: Lie on your back with your arm out to your side at a 90-degree angle, and your elbow bent at a 90-degree angle. A: Cups your elbow with one hand while the other supports your wrist and hand. S: Lie on your back with your arm at your side, palm up. A: Supports your wrist or hand with one hand while the other supports the back of your elbow. M: Raise your arm up over your head, keeping your forearm in front of your elbow straight, as if you were raising your hand to ask a question. S: Lie on your back with your legs straight and slightly apart. • Kneels between your legs, with one hand cupping your heel while the other hand holds the knee of the same leg. The attendant's knee may be resting lightly on your other thigh to stabilize your leg on the bed. • Kneels between your legs, with your heel cord resting on the attendant's shoulder. One of the attendant's hands should be placed on that knee to keep it straight; the other hand should be on your other thigh to stabilize that leg on the bed. M: Slowly raise your leg up, keeping your knee straight. Do not allow your leg to roll out. When your raised knee begins to bend slightly from the tension, ask your attendant to lower your leg slightly and hold. Do not move beyond the leg pointing straight up to the ceiling. Please remind your care partner or attendant to use careful movements and to protect against stretching out or hurting his or her back! 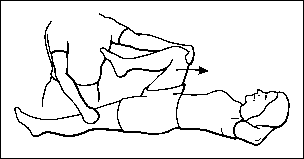 Supination and Pronation S: Lie on your back with your arm at your side and your elbow bent at a 90-degree angle. A: Supports your wrist and hand and stabilizes your arm just above your elbow. M: Turn your palm up, then turn your palm down. Repeat, keeping your elbow straight. S: Lie on your back with your arm straight at your side, palm up. A: Supports your wrist and hand with one hand while the other stabilizes your upper arm. 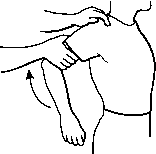 M: Straighten your arm to its fullest, then bend your elbow, bringing your hand to your shoulder. 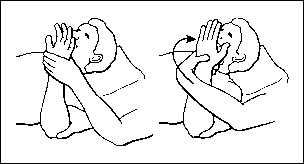 S: Lie on your side with your arm resting on your hip or behind your back. A: Cups one hand on the front of your shoulder, with the other placed so that the pinkie side of the attendant's hand is next to your shoulder blade. M: Applying a firm pressure backward on your shoulder, slide the other hand under your shoulder blade, lifting away from your back. 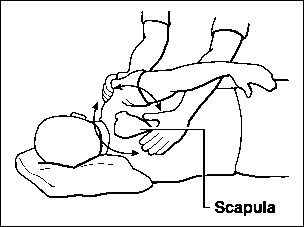 S: Lie on your side with your arm resting on your hip or behind your back. A: Cups one hand on the front of your shoulder, with the other placed so that the web of the thumb meets with the angle of your shoulder blade. 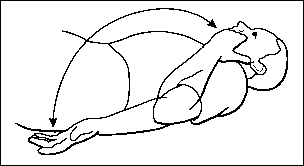 M: Moving both hands circularly in the same direction, roll the shoulder blade slowly in a large circle. S: Bend your wrist up, keeping your fingers relaxed. A: Supports your hand and wrist. 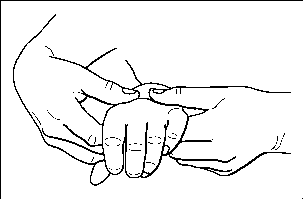 M: Gently bend your fingers toward your palm, being certain to keep your wrist cocked (bent) up. A: Supports your hand with one hand while the other stabilizes your forearm. 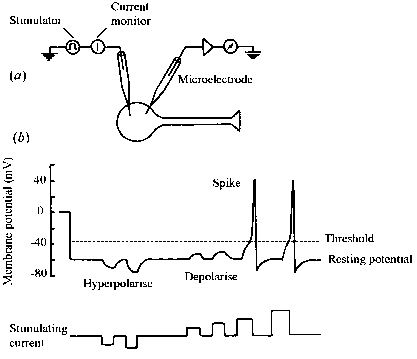 M: Move your hand from side to side, not allowing your wrist to bend up or down. A: Supports your forearm with one hand while the other hand clasps your palm, being certain that your fingers are free to move. M: Bend your wrist down, allowing your fingers to straighten at will. Bend your wrist up, being certain that your attendant's hand and fingers do not interfere with your fingers' bending. S: Keep your wrist in line with your arm, not bent up or down.